As my children grow older, I really want to start incorporating giving and serving others into our Christmas traditions. It’s easy to get caught up in the bright lights and materialistic side of Christmas, but giving is the true spirit of the holiday and I want my children to know and see that through our family even at a young age. 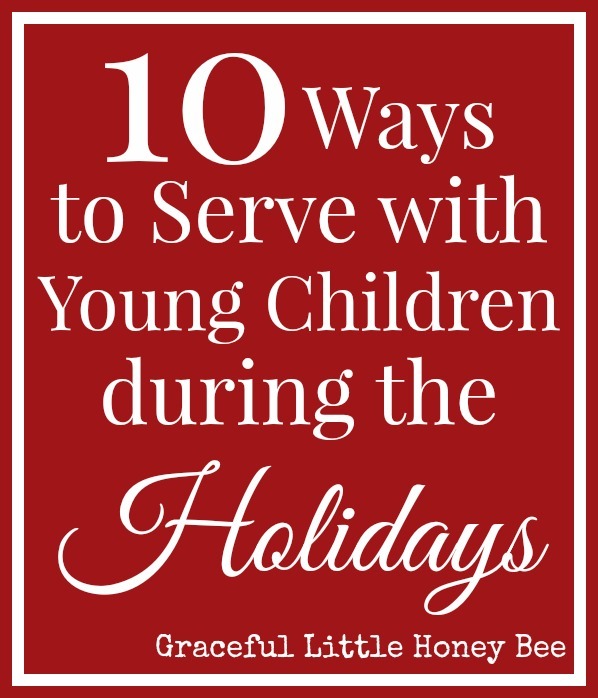 So here are 10 ways to serve with young children during the holidays. The best way for children to learn about giving is to have them make a card or picture to give to someone that they love. You could also have your children make cards for neighbors, church members, servicemen (and women), the elderly, troops overseas, etc. Christmas shopping just wouldn’t be the same without the many volunteers who ring bells in front of each store, would it?? Did you know that you can visit RingBells.org and pick a time and location to volunteer to be a bell ringer yourself? I did this once back in high school and it was easy and fun. What a great way to serve this holiday season as a family and to teach your children about the Salvation Army and all of the good that they do for others! We may not normally think of prayer as service, but it’s a great way to teach your child about the needs of others. You could commit to praying for a different family member each night before bed from now until Christmas. Go to your local mall and pick a child off of the angel tree that is the same gender and age as yours and go buy them the things that they need. This is another easy and hands on way to get your child involved in serving this holiday season. Call your local food pantry and ask about their greatest needs and then take your child to the store and let them help you pick out the items. Then drive directly to the facility and have your child help unload and donate the items. Programs like Child Fund and Save the Children allow you to sponsor children in need through a monthly donation. I’ve personally done this for over a decade now and I get so much joy from corresponding with my sponsored children. You can also check out their online Christmas catalogs and make a donation for things like clean water or mosquito nets. What a great lesson it would be to sponsor a child in your child’s name and encourage them to draw pictures and pray for them on a monthly basis! Did you know that families at St. Jude never receive a bill for treatment, travel, housing or food? What a blessing this is for those families who are battling childhood illness! You can get your child involved by letting them make cards for St. Jude patients and sending them in the mail. I would also urge you to consider becoming a Partner in Hope and commit to donating monthly to the amazing work of St. Jude and explaining to your child to be thankful that they are healthy and to pray for those who are sick. I am looking forward to doing incorporating these ideas into my own family traditions this year and I hope you will consider doing the same! I'm so glad you enjoyed it and thank you so much for sharing! :) We've never done Angel Tree, but we love the tradition of filling shoeboxes each year for Operation Christmas Child. Have a great day! Great ideas; we like to do these kinds of things with our kids too. Always encouraged when others do as well. These are all fabulous ideas! This year, we decided to donate a decorated Christmas tree to the Festival of Trees. It's not something our daughters can really get involved in (2 yrs old and 10 months old), but it's something we could handle even with how busy we are. I can't wait to do some of these next year! 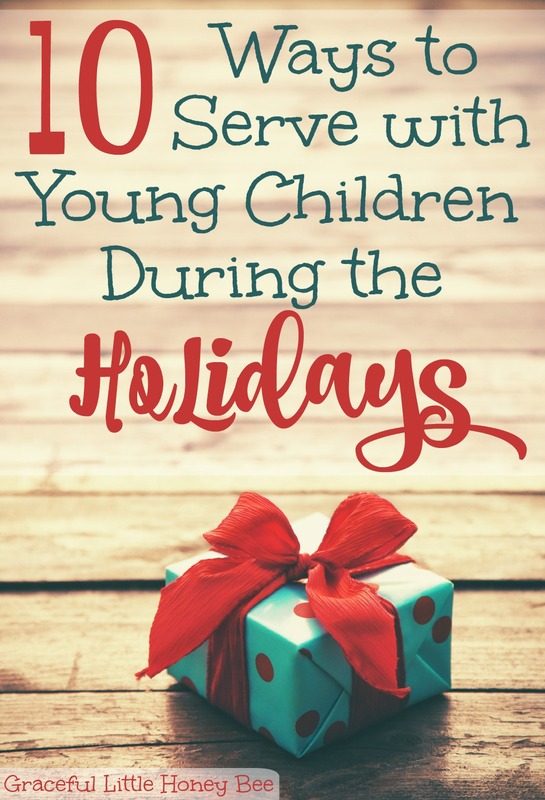 These are all great ideas and wonderful ways to teach our kiddos the importance of giving and serving not only this wonderful time of year but all year long. Thank you for sharing these great ideas. GREAT ideas here! I have a 6, 4 and 1 year-old and LOVE filling the shoebox up each year! We are going to try to deliver goodies to the service men and women this year!